Believe it or not, I'm a t-shirt girl through and through. I wasn't always, though. Before I could sew, I hated t-shirts. Finding a good (cute) fitting t-shirt was hard for me, and honestly, I had written them off for quite a while. 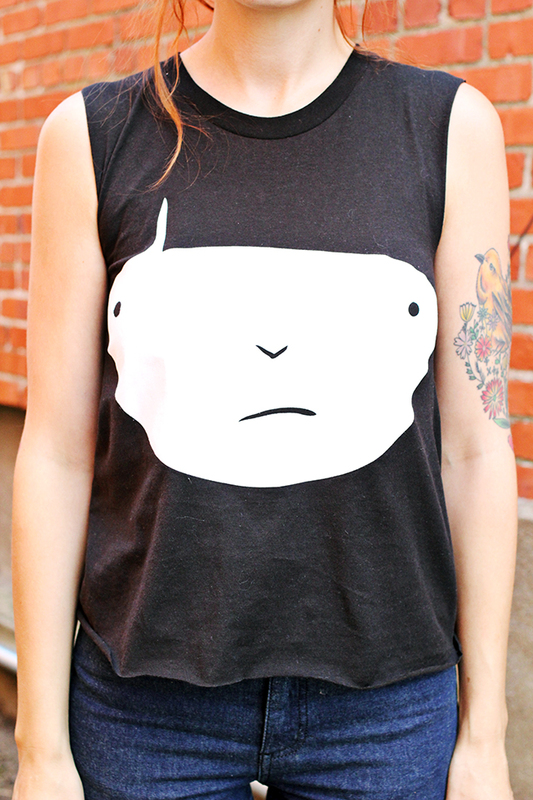 Now that my sewing machine and I are on good terms, I never pass up a cute tee. If it doesn't fit, I just chop it down and stitch it up until it does. 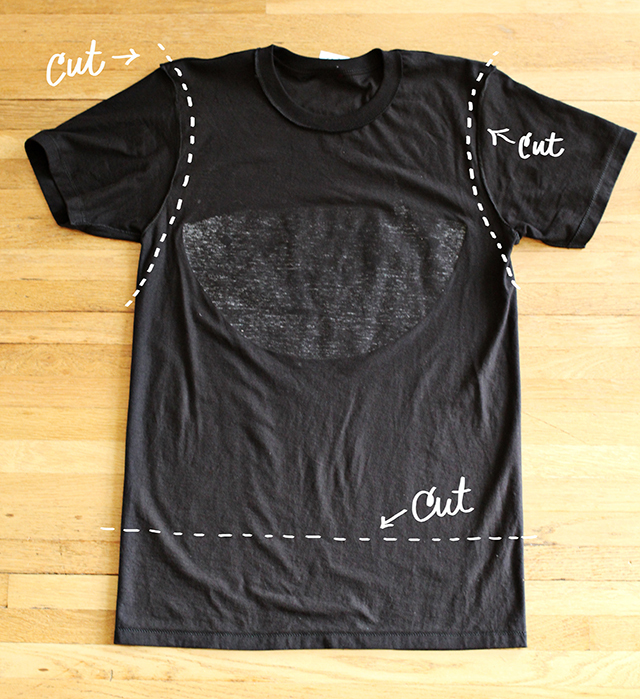 Turn your tee inside out and cut where I've shown. 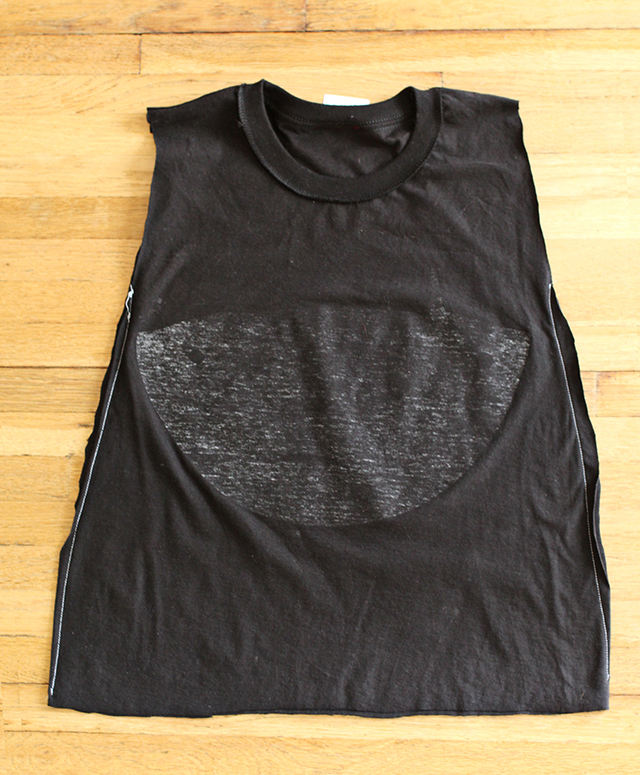 Don't just cut the sleeves off, but make sure and completely get rid of the seam. We'll create a new one. I stitched this shirt with white thread so you could see where I sewed it. Not only did I stitch the arm holes a little smaller (we don't want it to look like a workout tee), I did size down the body slightly. I always leave my edges raw when resizing tees, but you can definitely hem the edges if you want a more professional looking result. 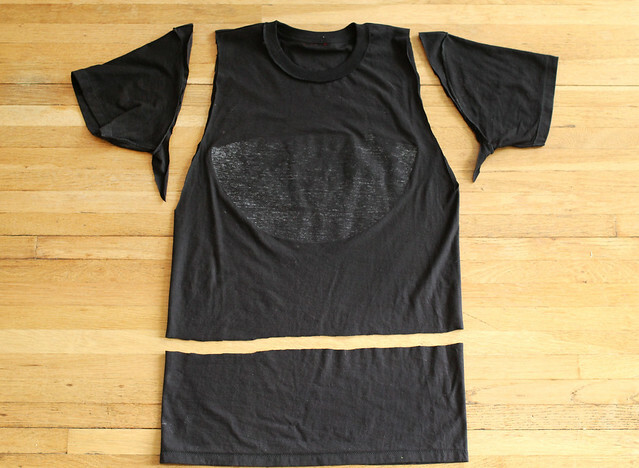 I personally like the way a cut-up t-shirt looks. I used to hate sewing with a machine before I bought a reliable one. 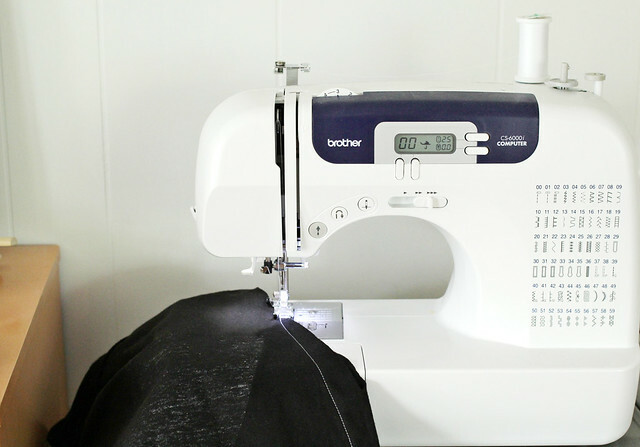 It seemed like my sewing machine always needed something fixed or oiled or tweaked, and it made sewing seem like a chore. Now that I have a machine that's easy to use and easy to troubleshoot, I really enjoy sewing projects. I get a lot of questions about my machine (it's a Brother CS6000i) and how I like it, so I'll just tell you now: thumbs up. 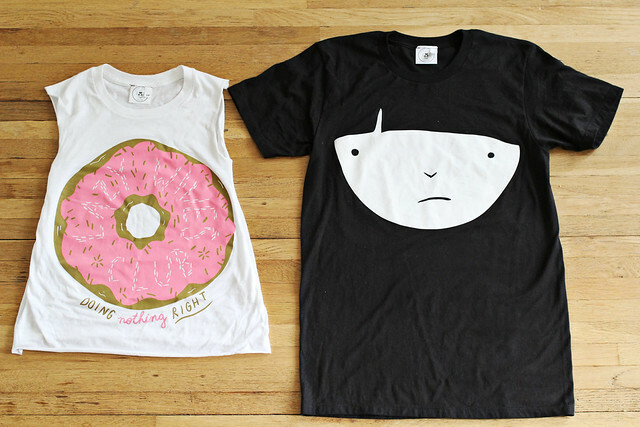 If you're interested in either of these t-shirts you can find them over at Stay Home Club. Happy sewing! Darling! Love what you did with it. Keep up the creativity! Thanks for sharing! I have a camo tee sitting on my chair waiting to be chopped up! oooh, love this! one to remember! That sewing machine is THE BEST! I have it and I love it. Also, that t shirt with the face totally reminds me of the online comic toothpastefordinner. Hilarious. Oh man, thanks for this! I've done things like this, but it never seemed to look right. I never thought to sew down the sides to fit it better! 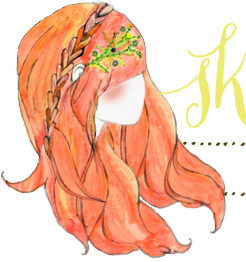 This DIY is so so fun! brilliant job! i love your denim too! Just bought two tshirts from Stay Home Club, and now I know exactly what to do with them! Super cute. I'm definitely glad that I'm able to alter clothes. It's a good skill to have! ah I love stay home club t shirts! and I do the same thing to all my t shirts, always always chopping the sleeves off! Just finished chopping up a t-shirt that I've never felt right in, and now I can wear it again! Thank you! I have a drawer full of tshirts I don't wear anymore. Maybe I should try cutting them up. Such a cute idea, I love it and will definitely have a try with this! I love her designs! Been eyeing the no new friends shirts for a bit... Maybe after the wedding I'll place an order!! This is so cute! I am terrible with sewing machines, but maybe it's because I don't have a good one. I once sewed straight through my thumb nail in high school home ec sub sewing and home crafts (it was an elective). Seriously my teacher was like how did you do that? I failed all the sewing parts except buttons, but I was awesome with the hot glue gun. This is very creative and resourceful. Make your own designs from old shirts and make it for new style is perfect. Thank you for sharing this idea. Two thumbs up! Cool! I can make use of this tutorial on some of my old casual wear shirts to make it on style these days. I love it. I love your idea, I do have a tie dye shirt with me however I just don't have the sewing machine and I don't know how to do it with hands. Hope you can share some that doesn't new to do much of sewing. I'll keep following your post. Thanks.